ORLANDO, FL–During my career with the FBI, I received special training in special event security planning & preparedness and worked numerous special security events including the Super Bowl, World Cup Soccer, Visits of Heads of State including the President & numerous NASA Space Shuttle launches & landings. Post FBI, I was responsible for corporate security in a privately held transportation company. And was more recently attached to the investigative & plainclothes surveillance unit at Walt Disney World [WDW], monitoring park events, company assets and guest attendance. Special event security procedures are generally employed at WDW where park attendance reaches daily averages totaling in excess of 25,000 guests. On New Year’s Eve attendance at EPCOT and the Magic Kingdom totaled in excess of 75,000 guests … requiring special event security planning. Besides terrorism, today’s security professional needs to be trained to look for serious crimes occurring within their venues. These crimes range from random physical assaults to targeted shootings and stabbings, homicides, vehicle attacks, car bombings, Improvised Explosive Devices [IEDs], lone wolf attacks and deadly scenarios involving an active shooter. And this is on top of their responsibilities to handle incidents involving a “disgruntled” employee or guest or a routine accident. Special event security planning is a must for any would be security professional in today’s global environment and the FBI and U.S. Secret Service provide some of the best training. Law enforcement agents warn a venue’s accessibility and exposure are key considerations for terrorists deciding on a target. And media feeds confirm their warnings, broadcasting headlines about mass casualties when venues are attacked. Television screens carrying images of wounded concert-goers in Manchester, England and two other incidents in France and Belgium also tell the story … big crowds and open venues are the ideal “mix” for terrorists. Street fairs, movie houses, convention halls and bars … all entertainment venues … are the perfect paradigm for terrorists. Given the moniker, “Soft Targets,” the venues are a security professional’s nightmare because they usually lack important security protections, are easily accessible and numerous. Finding the right compromise … making sure patrons are safe and still have fun is what special event security planning is all about. Special-events, attracting large numbers of guests, are now presumed to be terrorist targets. Security requirements for these events are unique … requiring a specific level of combined intellect and experience. Security professionals with distinct skills and proven strategies need to implement “best practices” to identify and mitigate any threat. Simply put Security Directors [SD] need to identify/classify any threat and/or risk, develop plans to combat same, document both, and thereafter, implement policies & procedures to defend and protect both the venue and its guests. Establish security priorities. Develop and implement a proactive protective Crisis Management Plan [CMP] to reduce and mitigate any risk. Raise terrorism awareness. Seek assistance from knowledgeable management & staff. Establish an on-site Command Post [CP] responsible for credentialing, controlled access points and bag checks. Screen visitors & restrict access. Install/use magnetometers [walk thru & hand-held]. Initiate CCTV coverage including place for easy viewing. Have plan to monitor/address crowd flow & density issues. Provide briefings to event staff, including developing and discussing contingency plans. NOTE: It’s not just the main event that requires security consideration and protection. Most events also schedule Fan Fest Events, Mini-Concerts, and Pre-Event Dinners … all requiring security, as well as Meet & Greet Receptions prior to the main event. Procedures and policies must be in place to handle unexpected visitors and guest list problems. Screening procedures need to be understood by everybody. Access controlled venues need to be tightly maintained. Parking & traffic problems can easily create issues which personnel need to address immediately. Remember each venue is unique. Deter. Detect. Delay. Deny. Perimeter security is your first line of defense. Beginning with the front gate vendors need to establish layers of physical security. Acceptable limits for access control must be defined. Consider establishing a perimeter barrier that creates both a physical & psychological deterrence to an intrusion. Barriers help security personnel with controlling “not only access, but assist with crowd control & directing vehicular traffic thru designated entrances. Quantify potential risks. Look at the event’s location. Determine its size inside and out [parking]. Determine the event’s duration. Think about security before and after the event. Conduct crime analysis for the venue. Collect/analyze intelligence regarding any potential threat and the likelihood of an incident. Consider conducting interviews and site surveys and making site observations. Evaluate security plans for local hotels. Analyze routes and modes of transportation for the venue. Liaise with law enforcement. By definition CM is the process of dealing with sudden emergencies. Identify and plan for emergencies. Develop strategies to address them. Ensure staff is familiar with Emergency Response Plan [ERP]. Consider walk-thru or dress rehearsal with the ERP. Liaise with emergency services personnel. Ascertain number of security personnel needed for each post. Address all layers of security. Make sure sufficient personnel are available to guarantee perimeter security, in particular points of ingress & egress and venues requiring penetration testing to uncover vulnerabilities. Ensure due diligence investigations are conducted and completed for personnel. Credential both uniform & non-uniform staff. Ensure 24-hour coverage once perimeter security has been established. Discuss security awareness. Ensure guests are monitored both arriving and departing (Manchester Bombing). Ensure emergency personnel are on site. Make sure you have sufficient personnel to handle specialized tasks, including administrative managers, communication dispatchers, K-9 handlers, bike patrol officers, plainclothes and surveillance officers and IT people. Likewise, make sure you have appropriate specialized equipment and resources, including walkie talkies, batteries & battery chargers, motorized vehicles and more. Consider using roving bike(s)/golf cart(s) and medical patrols. Ensure designated personnel are knowledgeable maintaining a covert posture, trained in behavior and situational awareness, techniques of observation and normalization, and indicators of suspicion & terrorist activity. Post a “see something … say something” poster throughout the venue with a visible telephone number so guests and visitors can call Command Post [CP]. Poster has proven to be an effective means … conveying message, “security is everybody’s business.” Also tells guests and public what to do, per chance, somebody sees something suspicious … like an “unattended” bag and/or a worrisome individual. It’s also faster than calling police. Conduct a “hot wash.” Critique performance & responsibilities. Identify strengths & discuss weaknesses. Prepare an After-Action Report [AAR]. Maintain AAR for future reference to minimize costs and help with your next special event security planning. Include suggestions & methods to modernize security plan for future events. NOTE: Remember an AAR is only an aid. It’s not a substitute for a Security Plan and doesn’t replace special event security planning. AARs always need to be adjusted so SP recognizes the current landscape. Using the previous year’s plan as a substitute because there was no incident is a simple recipe for a disaster and cataclysmic event. PETER D. YACHMETZ is a retired agent and 29-year FBI veteran with both private and corporate sector security experience. Classified as a subject matter expert (SME) in Physical Security & Access Control, Pete is well acquainted with all aspects of Physical Security [PS], Special Event Security [SES], Corporate Security [CS], Field Intelligence [FI], Terrorism [T] & Crisis Management [CM]. Responsible for Corporate Security Programs [CSP] in a privately held transportation firm, Pete has directed corporate security operations, conducted security assessments [identifying exposures & vulnerabilities] and implemented proactive security protection measures [correcting site security vulnerabilities & access control deficiencies]. A plainclothes operative with the security complement of Walt Disney Company [WDC], Pete has also routinely monitored major security events. And applying established security measures, he regularly protected the company’s reputation and brand … all while ensuring guests, WDC cast members & company assets were safe and secured. He is also trained as a Behavioral Assessment Specialist. 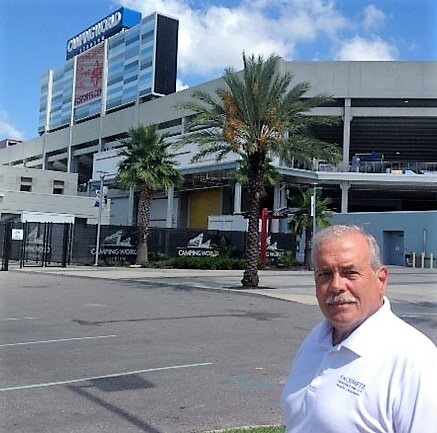 dba YACHMETZ CONSULTING GROUP LLC – today Pete is a security & risk management consultant, providing both physical & facility security and major special event security. He can conduct Vulnerability Assessments [VA] and offers Due Diligence Screenings [DDS]. Pete’s specialized proactive security training, longtime law enforcement contacts and available resources make him the go to person companies call seeking security and protection.